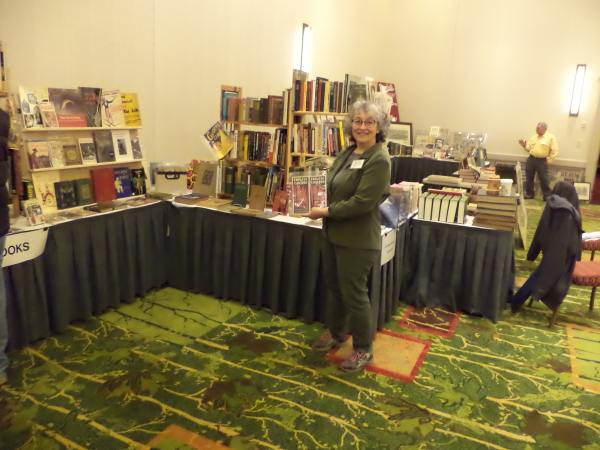 My good friend Barb seemed to have an inordinate amount of fun assisting me with manning a booth at the Rochester Antiquarian Book Fair last September. She readily agreed to come along on a joint book hunting and genealogical research expedition to Burlington, Vermont this past weekend. Old Saratoga Books was signed up as an exhibitor at the Vermont Antiquarian Booksellers Association Spring Fair on Saturday, April 8th at the Burlington Hilton and Barb was interested in doing some family history research at the University of Vermont Library's Special Collections, so we made it an extended weekend. We started our journey on Thursday with a trip up Vermont's historic Route 7A from Bennington to Dorset, stopping along the way at thrift shops, antique stores, and the Cheese House to load up on books, treasures, and lunch (some great Mustard and Ale Cheddar and lavash crackers). Switching onto Route 7, we made our way to the beautiful town of Wallingford, Vermont, and the Helping Hands consignment shop where we really scored. We loaded up on some great clothing finds (polka dot dresses for the both of us for upcoming graduations and weddings), some books, a funky 50s lamp shaped like a leaf ($1! ), elegant pajamas (Vermont Country Store donations in pristine condition), artwork, and even a spoon rest painted with a rat design. The Rutland Goodwill was huge and Barb was thrilled to find a hand model for her knitting creations and we both scooped up some unique artwork. It was a dark and stormy night by the time we rolled into our hotel on the outskirts of Burlington so we caught a late Korean dinner at Naru and tucked ourselves into bed for a full day of genealogical research the next day. Barb was tracking down some ancestors at the University of Vermont's Bailey-Howe Library Special Collections and they had five boxes of files awaiting her. I was her scanning assistant and read a book while she took notes and burbled excitedly over some finds among the letters, legal documents, ledgers, and other historical items they provided. The staff was wonderfully accommodating (we were able to personally thank one of the librarians again the next day when she came into our booth at the Book Fair) and the scanner was a thing of beauty: easy to use, free, and delicate documents were immediately emailed to Barb to examine later in detail. The Special Collections area had a small exhibit of Vermont patent medicine broadsides which were fun to examine. I also found a small stash of free books- library discards- conveniently located on the way to the rest room, so that was a plus. Note that parking is at a premium on the UVM Campus, and you will have to hike a bit (for us it was in the driving rain, which was at least not snow) from the visitor's parking lot. We warmed up later that afternoon with a Mexican-El Salvadorian-Filipino lunch at Esperanza Restaurante, which we both recommend. Good tamales, ceviche, and lumpia! We still had a free afternoon, so we pointed the van north and headed half an hour up to St. Albans, Vermont, an historic town with a vibrant Main Street and popped into The Eloquent Page. Donna Howard is the longtime owner of this bookstore which carries new and used books, with a specialty in books about costume and fashion. Her store is in a Victorian storefront with patterned tin ceilings, comfy reading chairs, and soaring shelves packed with unusual and reasonably-priced books. I got some great titles for some upcoming catalogues on 20th century history and of course, some books for my own home library. Donna is also the Book Fair manager for VABA's Spring Fair, so she was busy with last minute arrangements on top of her bookstore duties. The Eloquent Page has strong sections in Vermontiana, American and European history, cookbooks, and children's books, as well as a good selection of fiction, organized by genre and title. A great shop for readers and collectors, and even other book dealers! 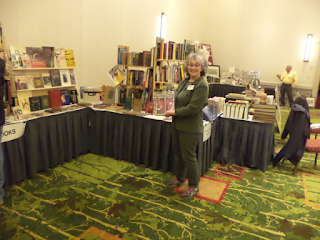 Saturday saw a frosting of snow for the opening of this Spring Book Fair, but we were undaunted and got there early to set up and prowl around other dealers' books. I was testing out two new face-out bookshelves that my husband made (er, copied) from John Hess at Catamount Books. John's booth is a thing of beauty, with lots of eye-catching dust jackets and book covers, and he was correct in stating that this shelf design allows sellers to bring less but sell more. I did sell about 1/4 of the books that were facing out on those shelves, which was impressive. Eye candy sells. Military and Adirondack history sold well, as well as older children's books, cookbooks, Vermont items, antique travel, and ephemera. The crowds were strong for the first four hours, but then sales and attendance dropped dramatically and the last two hours really crawled. That's where having a buddy like Barb was key, as she graciously let me steal away to talk shop and peruse other dealers' offerings. I found some nice antiquarian literature and women's history at Jean Hopkins' booth, a funky bound volume of phrenology at Fred Wright's booth (that's Fred and son Chris in photo below), and a great broadside temperance ditty at Jean Tudhope's booth. The VABA Spring Book Fair was a good "provincial" fair for buying and selling. Loading in and out at the Hilton was easy, with no bottlenecks other than the hotel's revolving door. You had to time things just right to blast through with your loaded boxes, particularly in my case since I had forgotten my hand cart and was making use of one of the Hilton's ginormous luggage trolleys. Barb and I finished up our book hunting adventures the next day with a trip to Burlington's ReSource nonprofit thrift shop. The books were plentiful and cheap and I loaded up on lots of store stock. Barb scored again with a worm factory for her garden. We finally had some nice spring weather to drive in and the ride back was sunny and gorgeous. Another cheese and cracker lunch at Dakin Farm in Ferrisburgh, VT sustained us until we could get to The Bookmobile, in Rutland, VT. I forgot to take pictures, but it was a great space full of new and used books. I bought a nice stack of older cookbooks, 60s music, poetry, and natural history, and then it was back in the van heading south for a nice homeward welcome.